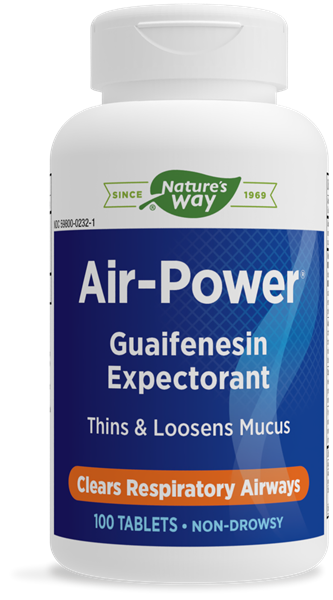 Air-Power® / 100 tabs - Nature's Way®. Ask a doctor before use if you •have a persistent or chronic cough such as occurs with smoking, asthma, chronic bronchitis, or emphysema •have a cough that is accompanied by excessive phlegm (mucus) • are taking antibiotics or any other prescription medication. Is Air-Power® safe for children? Yes, Air-Power® can be given to children six-years-old or older. Do not use on younger children without a doctor’s supervision. For dosage information, please see the product recommendations. What other products can I take with Air-Power®? Can I take Air-Power® if I am on the Guaifenesin Protocol? No. The Guaifenesin Protocol was developed by Dr. R. Paul St. Amand and involves taking guaifenesin, avoiding salicylates, and following a diet low in carbohydrates. Air-Power® is not suitable for this protocol because some of the herbal ingredients in the formula may contain small amounts of salicylates. Do not use this product if you are pregnant or nursing. Do not take this product for persistent or chronic cough such that occurs with smoking, asthma, chronic bronchitis, or emphysema, or where cough is accompanied by excessive phlegm (mucus) unless directed by a doctor.